Last week I reported my mourning over one of our colonies that had gone queenless – or so I assumed – just as winter is finally setting in. Rather than having their hard-earned stores go to waste due to robbing or pest infestation, we decided to remove all the frames, and empty the hive. After removing the frames, and shaking the bees off of them, we left the lid open assuming the bees would disperse. But they didn’t; they formed a tight ball under the open lid instead. 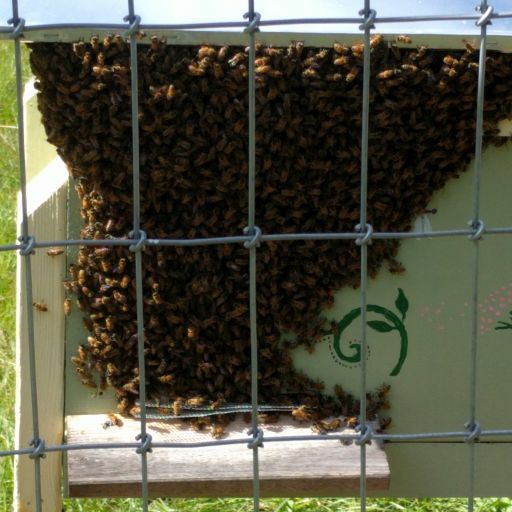 After a few hours, we blocked off the entrance, shooed as many bees as we could out of the hive box, and closed the lid. I assumed they would quickly succumb to starvation and exposure to the chilly night air. But after several days, their number hadn’t significantly decreased, and the weather wasn’t cooperating either. Instead of a winter chill, our South Carolina Indian Summer stubbornly hung on. Day after day, as we worked on the property, we had to go past the orphaned colony hanging out above the locked entrance of their former home. Foragers left and returned, but had nowhere to store what little they had been able to scrounge. It was truly heartbreaking – knowing (or rather assuming) their fate was sealed – to watch them hanging on and carrying on with their business as best they could. Then yesterday, a friend posted in our bee club’s discussion forum a report of a meeting he had attended in which the speaker had been asked about colonies with no brood and no eggs just like our orphans. The speaker’s take on the situation was that such colonies aren’t necessarily queenless, but their queens have simply stopped laying due to local conditions. My friend recommended doing a queen test using a frame of eggs and young brood from another colony. The problem was that I had already practically killed off the colony by locking them out of their home and taking all their food. If their queen was still present, but simply not laying, I had all but murdered a perfectly healthy colony. The first thing to do was to get the colony back into the hive. Although I didn’t see my friend’s post until bedtime, I immediately suited up, put the empty brood frames and two of their honey frames back into the hive box, and opened up the entrance. I expected that when I came back this morning they would all have gone back inside. But when got up this morning, they were still balled up under the overhang of the roof. The situation was critical, because today was quite chilly with at least a week of near freezing temperatures in the forecast. I had to get those bees back into their hive. I got suited up again as soon as the temperature was as high as the forecast said it would get today, and brushed the bees off the front porch onto a baking sheet and then shook them onto the tops of the frames inside the hive. Once most of them were inside, and the others looked like they were moving back in, I opened the hive next to them, to look for a brood frame I could use for a queen test. We had inspected that hive just two weeks ago, and seen the queen, young larvae, and eggs. But this morning I couldn’t find a single frame with uncapped brood suitable for the queen test. In fact, the brood frames we’d seen during the last inspection are now largely empty. Since it was so chilly, I quickly closed up both hives, and a little later restored all the honey frames we’d taken from the orphan colony last week. Praise God that we hadn’t yet gotten around to extracting that honey. Please pray for my bees. Sometimes I think they would be better off fending for themselves in a hollow tree or the abandoned house trailer next door than they are under my watchful (and overly meddlesome) keeping.